Cassie Tunick is a performer, writer, and teacher. Raised in California she arrived to theater in her early twenties by way of dance. Originally trained in ballet and modern technique she began an intensive practice in Action Theater™ with Ruth Zaporah in 1991 and since then has been improvising and creating original physical theater work on stages from San Francisco to Viljandi, Estonia. Fascination with language led to an MFA in Writing and Poetics from Naropa University, a small Buddhist college, which then influenced her theater work on many levels. In 1999 she became a member of Shinichi Iova-Koga's inkBoat company and was introduced to Butoh dance and a starkly imagistic theater-making that resonated with an ongoing delight in the surreal and darker world of fairytale, myth, and the profoundly mysterious nature of being. 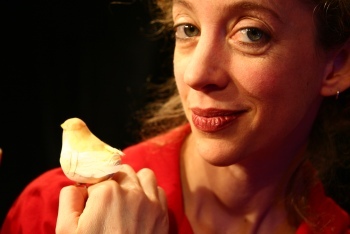 Since moving to New York in 2004 she has continued solo performances as well as collaborating with such talented artists as Tanya Calamoneri & Company SoGoNo, composer Keren Rosenbaum's Reflex Ensemble, Shinichi Iova-Koga, the Action Theater Ensemble, and is featured in three films with and by video artist David Finkelstein. Past collaborators also include Owen Walker, Sten Rudstrom, Sabine von der Tann, Leigh Evans, Katie Yates, Max Regan, and Etiquette (Marielle Hare and Linda Carr). She has danced for Tracey Rhoades' Exploding Roses, played keyboards for the band The Mad Scene, and contributed vocals to Barbez. Currently she performs in the company she founded: Second Nature. Second Nature (with musician Danny Tunick and long-time colleague Heather Harpham) continues to be presented regularly by Roulette and Triskelion Arts. Most recently she teamed up with Abby Bender to create a new two-woman show, Totally Other, a dance-theater work examining fluidity of identity and imagination. Cassie is a Senior Teacher of Ruth Zaporah's Action Theater and has devoted herself to the practice and development of improvisation for the last 25 years. She worked closely with Ruth editing Improvising on the Edge: Notes from On and Off Stage. Her teaching and performance practices inform and re-invigorate each other. Action Theater is a training system in physical theater improvisation that builds vocal, verbal, and physical performance skills, hones awareness and increases expressive range. Action Theater uses embodied presence as a doorway into the agility of a vast imagination. The exercises incorporated are simple, playful and challenging and work on a deep level to expand moment-to-moment awareness and its relationship to both action and being. How do we fully experience how we are? The distracting power of judgement and fear is calmed as one's curiosity and compassion for the smallest moment is roused, however lovely or terrifying it might be. Central elements to the practice include listening, composition, musicality, alignment between form and feeling, the beauty of lost detail, the inhabiting of mercurial energies, and a way of relaxing into the active nature of time and change with eloquence, precision, and passion. While operating as a performance practice, these investigations speak to people from all walks of life.